"It gives personnel confidence and effectiveness, and facilitates communication and the spread of ideas within the company itself." Become Skilled at Influencing and Persuading — Persuading others is a very important ability in anything you want to do and can play a great role in achieving your goals and dreams. It is one of the most popular seminars I am asked to teach to my corporate clients, because it gives their personnel confidence and effectiveness, and facilitates communication and the spread of ideas within the company itself. “I had the pleasure of interviewing Dr. Alkistis Agio, creator of “The ALKISTIS Method®” which transforms fear, frustration, anger and anxiety into confidence and self-leadership. Dr. Agio is a world-renowned speaker, author and consultant with over twenty years experience in working with professionals to transform fear, frustration, anger and anxiety into confidence and self-leadership, through her proven method, “The ALKISTIS Method®”. Of Greek origin, she grew up in Montreal and has worked in Italy, France, Germany, Greece, the United States and the United Arab Emirates. She speaks five languages. Dr. Agio studied International Banking at the Chartered Institute of Bankers in London, and has a Master’s in Integrative Psychotherapy and Doctor of Philosophy, specializing in Transpersonal Counseling. She has studied Neuro Linguistic Programming with its originators, Tony Robbins & Richard Bandler and has served as a trainer for the Dale Carnegie System for several years before developing her own method. Dr. Agio is the author of several Books, the most recent of which is “TAKE CHARGE — The 3 Golden Principles of Greek Philosophy for Self Leadership” and is available at Amazon. I was working at an international British bank in corporate finance. On the outside, I seemed to ‘have it all’; an executive position with a good salary, luxury travels and friends in ‘high places’, but on the inside I felt frustrated and anxious about my career path, which I had chosen mainly to please my parents. I would often think to myself, “I’m living a lie… I don’t like my work. I don’t belong here. I feel unmotivated. If only I had a purpose I could believe in…” But since I couldn’t decide what I really wanted, I stayed on, feeling trapped like a hamster on a treadmill. Then came one the most defining moments in my life… I was called to do an important presentation in front of the CEO and board of directors, but I wasn’t prepared at all. Not because I hadn’t done the work, but because it hadn’t stuck with me. I wasn’t interested in it and it showed. My performance was so bad that there and then, I faced my deepest fears and made a decision to leave my job forever and take charge of my life. Things got much worse after that, before they eventually got better; I had a dramatic argument with my father who told me that I was insane to throw away such a promising career and he kicked me out of his house. I left Greece with meager savings and wandered around Europe working in low-income jobs like waitressing and temping. I even tried creating my own businesses, but these ventures left me in debt. During that dark period, I was often filled with frustration, fear, anger and anxiety, but I ploughed on regardless. I finally got a break when I had the good fortune of being hired by a global leadership training company, to teach communication skills to managers. I found happiness and fulfillment in this job and was well-paid and appreciated for doing something that I seemed to have a natural talent for. This turbulent path is also what led me to develop The Alkistis Method®. It is a tool I wished I had back them, to help me take balanced, well thought out decisions aligned with who I am, and not crash out of a job I didn’t like without any plan in place. One of the most interesting experiences for me was when I was hired as a leadership trainer in the Emirates of Dubai and Abu Dhabi. I was hired by one of the biggest construction companies in the world to train hundreds of young (male) managers. Some of the attendees in my seminars had been raised with the belief that they should never look a woman in the eyes, or shake her hand or do business with her. When I began the seminar, many of them were very reserved and even passive agressive. By the end of the seminar though, they were raving with positive feedback and asking about when our next seminar would be. On leaving the seminar room, every young man shook my hand and looked at me in the eyes with gratitude and respect. This was a remarkable transformation, and I was quite proud of myself, for having achieved it with such a challenging audience. The truth is, I don’t remember any. I only seem to recall sad stories about how I was frustrated and insecure I was because things were not going my way and obstacles kept appearing on my path. The stress and anxiety resulted in me sometimes lashing out at the people who I love most, my husband and my sister, and blaming them for not supporting me enough. In the beginning they were understanding, but at some point my husband began teasing me and calling me a “Drama Queen”. At first I was taken aback, but then this characterization made me see myself through their eyes which began to make me laugh at myself too, and take things more lightly and in stride. 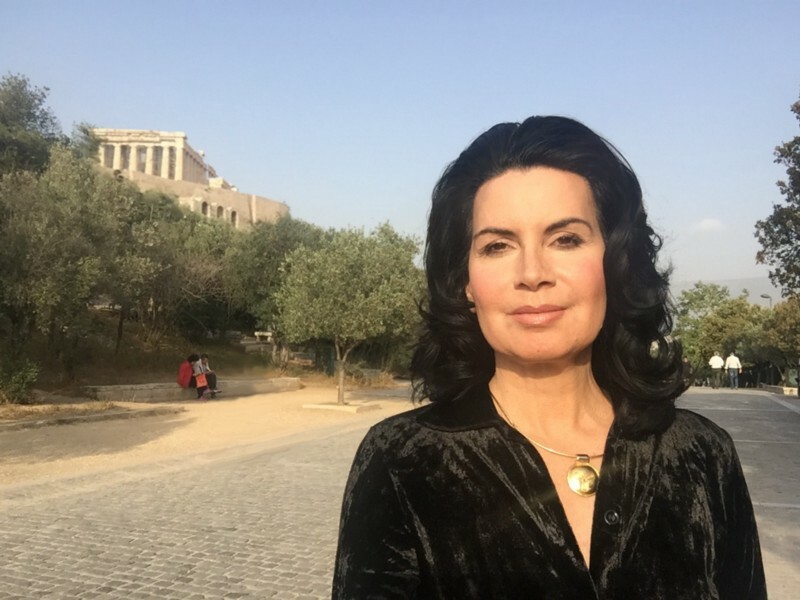 The ALKISTIS Method® is unique in that it is the first ever method integrating the modern findings of neuroscience with the timeless wisdom of ancient Greek philosophy. It is applicable today to all professionals, from CEOs to educators to entrepreneurs and it can empower anyone to reach their highest potential if they sincerely wish to do so. The finishing touches to my online course on Self-Leadership are being made, as we speak. The new online course will qualify people to become seminar facilitators of The ALKISTIS Method® for schools, universities, businesses and organizations all over the world. As this qualification spreads, many lives will be improved, alleviating people from fear, frustration, anger and anxiety. I am excited to promote The ALKISTIS Method® through speeches and workshops abroad and here in Greece! Socrates taught that, “No man can lead others, who cannot lead himself”. Basically, you need to learn to manage your own fears, frustrations, anxiety and toxic emotions and that is exactly why I created The ALKISTIS Method®; To make this transformation simple, straightforward, and make it a way of life. It is based on the 3 Golden Principles of Greek Philosophy: Ethos, Pathos, Logos as taught by Socrates, Plato and Aristotle. I think it’s wisest to leverage technology; Whether it’s video calls, real-time chat applications or shared project management applications, these help in orchestrating large teams. Of course, there should also be regular trainings and team-building events, so that the personal, face-to-face dimension is not lost. My sister Matina and her organization ’The Athenian Muse’ has offered me guidance and support throughout all the many years that my business has been developing and continues to do so today. When nobody else believed in me, she supported me in every way possible; Together we are creating a movement to popularize Greek Philosophy and show people how relevant and useful it can be today. Every month I volunteer to teach my seminars on self-leadership to the section heads and project coordinators of ‘SolidarityNow’. This is a network of people and organizations whose goal is to assist and support those most affected by the economic and humanitarian crises in Greece. 1. Be decisive — Making decisions is always hard, because there are many factors and risks involved. The most important thing though, is that you make them. 2. Control your emotions — Managing your psycho-physiological state, is no easy task, especially when there are deep seated fears and insecurities. 3. Become Good at Influencing and Persuading — Persuading others is a very important ability in anything you want to do and can play a great role in achieving your goals and dreams. It is one of the most popular seminars I am asked to teach to my corporate clients, because it gives their personnel confidence and effectiveness, and facilitates communication and the spread of ideas within the company itself. 4. Formulate Your Personal Mission Statement Clearly — A Personal Mission Statement is a tool that forces you to think about your life, clarify your priorities and shape your decisions and reactions, based on your values and your vision. It is a condensed, focused representation of your Ethos. 5. Seek Out Advice and Mentors — A very helpful way of moving forward, is finding or hiring a mentor or coach. This is someone who will help you pose the questions, keep your focus, and avoid biases and preconceptions that may affect your thinking. I deeply admire & respect Ethos in life and in the workplace. As such, I admire the philanthropic work of Bill Gates and would be honored to meet him and his wife Belinda.